Ruth Rogers and Rose Gray have created yet another superb book taking easy Italian cooking even further. River Cafe Two Easy has been written in the same clear, accessible style and is complimented by vibrant photography and a new, fresh and striking design. 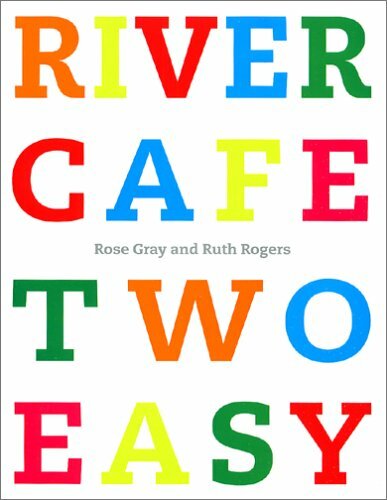 River Cafe Cook Book Easy pioneered a new approach to cooking and eating. Taking account of today’s frenetic lifestyles, Ruth and Rose set out to dispel the notion that stylish and healthy food meant spending hours in the kitchen. In this book, they have gone even further towards taking the hassle out of midweek cooking and weekend entertaining and have made it even easier to create delicious and nutritious meals in moments. They offer us a selection of delightfully simple mozzarella recipes, easy-to-assemble salads, perfect pasta, grilled meat and fish recipes, and cakes and puddings for those special occasions that do not rely on hours of slaving in the kitchen but on the wonderful flavours created by the combination of fresh, readily available ingredients. With recipes ranging from Potato and pancetta soup and Tomato, dried porcini and parmesan pasta to Lemon and almond tart and Pannacotta with chocolate, this book will have you planning tomorrow’s meals before today’s have been digested. Rose Gray, MBE (28 January 1939 – 28 February 2010) was a British chef and cookery writer, who set up (with Ruth Rogers) The River Café in 1987. She won a Michelin star for this in 1998. It was here that the talents of Jamie Oliver were first spotted. She had a profound influence on a generation of celebrity chefs, including Oliver and Hugh Fearnley-Whittingstall, the latter stating that she had had more influence on him than any other person he had worked with. She wrote a series of cookery books and presented a twelve-part television programme for Channel Four, “The Italian Kitchen”, in 1998. Born Clemency Anne Rosemary Swann in Bedford, her father, Flight Lieutenant Clement Nelson Swann, and an elder sister were killed in a domestic fire six months before her birth. She was brought up in Scotland and Surrey. Her mother, (Elizabeth) Anne Lawrence, daughter of Sir William Lawrence, 3rd Baronet, settled in Guildford, and Rose studied at the Guildford College of Art, where she gained a BA in Fine Art. Her career as a professional chef began at Nell’s restaurant in New York, after which time she returned to London.